Skydive Hibaldstow has long been regarded as a bastion of the experienced skydiver and team. It’s part of our bread and butter and it starts when the dropzone opens, working all the way up to the UK National Championships at the end of August. We welcome our teams and like to think we’re experts at getting them in the sky, time after time! 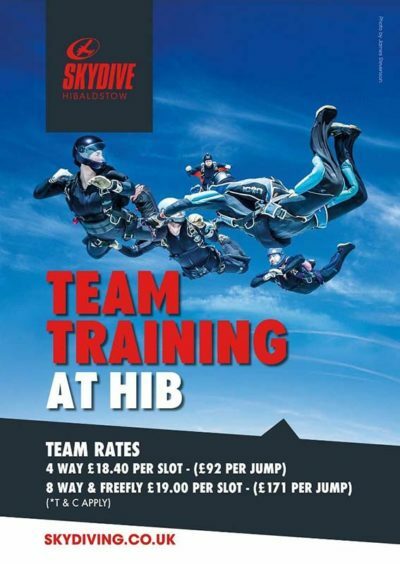 4-Way: £18.40 per slot, £92 per team jump (based on 5 people). 8-Way: £19.00 per slot, £171 per team jump (based on 9 people). Many of our teams usually arrive with their own coaches and the day starts at 8am. If you are in need of a fast-packing ace packer, then call the dropzone office on 01652 644837 and let them know as far in advance as possible. They will then do their best to allocated packers for you. For those teams that have 2 rigs, the dropzone allows back-to-back jumps depending on how busy it is. Many of our teams have no problems getting in 16 skydives, even on a hot summers day! Always start the day with a 20 minute stretch. Let the dropzone know how many jumps you would like to do per cycle. Often, at weekends, the aircraft run on a 5 load cycle. Meet up extra early to prep your dives. You don’t need to know the dives in great detail, but walking them all through in reverse order will definitely help. Being efficient when you land really helps to make your day run smoothly. If you’re packing for yourself, do this immediately when you return to the packing hangar, then get your cameraman or cameragirl to download their footage as soon as possible. Make sure you are properly fueled and hydrated. That can make all the difference and ensure your learning is as high as possible. If you are feeling tired and are questioning your energy levels, take a break, let the dropzone manifest know and then come back to get a few more skydives in! Lastly, try to enjoy your team training. For many, the journey is as important and as enjoyable as the final goal, the competition. This is where you learn, bond as a team and learn how each other works!